Samsung is set to replace its one-year-old NX100 compact system camera with the NX200, a 20.3-million pixel model aimed at the u2018entry-level DSLR territoryu2019. Samsung is set to replace its one-year-old NX100 compact system camera with the NX200, a 20.3-million pixel model aimed at the ?entry-level DSLR territory?. 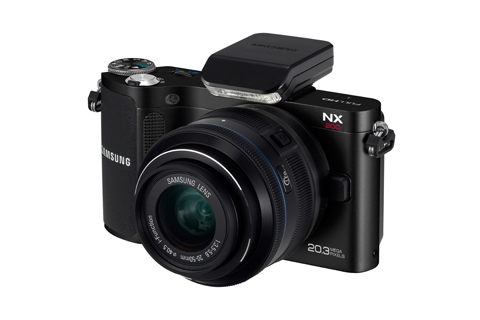 Differences over the 14.6MP NX100 include a new Samsung-made 20.3MP CMOS sensor, claimed to deliver lower noise levels. The APS-C size sensor cuts noise in two ways, according to Samsung, ?by direct digital output and reduced analogue circuitry noise using an optimised structural design?. AP has asked Samsung elaborate, but further details of the sensor technology were not available at the time of writing. The NX200 is smaller than the NX100, measuring 116.5×62.5×36.2mm (excluding protrusions), compared to the 120.5x71x34.5mm dimensions of the older camera. The difference is noticeable from AP?s first impressions of the camera at a press launch in central London. Unlike the NX100, the i-Function is now customisable, allowing the user to choose which settings he or she wants to use. I-Function, which allows photographers to toggle between settings such as aperture and shutter speed using the lens ring, has also been tweaked. A spokesman said: ?With the upgraded i-Function 2.0 on the NX200, users can also control six different Smart Filters and the intelli-Zoom function from the lens whilst in Lens Priority Mode.? The 10 Smart Filter effects include vignetting, miniature, Fish-Eye and Halftone Dots. Commenting on the launch, Samsung UK?s head of Digital Imaging Nick White told AP. ?The NX200 is a catalyst to really expanding ourselves in the second half of 2011 as we go into 2012.? The NX200, which is said to be compatible with SDXC memory cards, can shoot images at a burst rate of seven frames per secondPr, according to Samsung. However, AP understands that this is at a resolution of 11MP. AP has requested burst rate performance information for full resolution shots. Armoury includes an equivalent ISO sensitivity of 100-12800, an improvement on the ISO 6400 maximum of the NX100. Also new is a panorama function and 3D Photo mode. Video recording is now possible at a full HD resolution of 1920x1080p (MP4 format) and there is now a stereo sound feature. Samsung claims that the NX200 delivers an AF speed 100ms (and a shot-to-shot rate of 400ms). Improvements do not extend to the 3in AMOLED (VGA resolution) screen, however, which the NX200 shares with its NX100 predecessor. Samsung has installed a new battery (BP1030) claimed to be capable of 330 shots from a single charge. 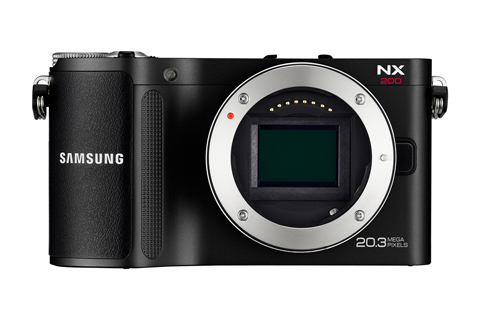 The NX200 is due to be available in two kit options from late September, both priced at £699. It will not be sold on a body-only basis. One kit includes a 20-50mm lens and the other an 18-55mm zoom. Though the camera does have a built-in flash both kits will include a hotshoe-mountable compact flash unit, specially designed for the NX200. The SEF8A, which is tiltable, has a guide number of 8 (at ISO 100). Asked how successful the NX100 has been, White replied that Samsung would have liked higher sales, but he stressed that the market has been ?challenging?. The NX100 is set to be discontinued. AP understands that Samsung will release a revamped version of its NX11 compact system camera next year. Meanwhile, Samsung has confirmed launch dates and prices for four previously announced lenses. The 18-200mm f/3.5-6.3 ED OIS is due out in mid-September priced £699; a 16mm f/2.4 will cost £299 (also due this month); while an 85mm f/1.4 ED SSA and 60mm f/2.8 Macro ED OIS SSA are expected out at the end of October at prices yet to be confirmed to AP. The 18-200mm features a ?voice coil motor?, designed to allow ?ultra quiet AF?, and is therefore suitable for shooting professional-quality movies, claims the firm. These launches should mean that Samsung has a stable of nine NX lenses by the end of 2011. A planned 16-80mm lens has been delayed until next year.